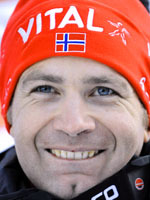 Many are the pundits who feel that the indefatigable Norwegian crackshot Ole Einar Bjorndalen is the greatest ever Winter Olympian with his record amount of World Cup wins and five individual biathlon medals from the Games. Born in January 1974, he would seem to be at the summit of his art as Vancouver plays host to the 2010 Games, having won the world championships sprint, pursuit, the 20km and the relay in South Korea in 2009. It was also a season in which he overtook the 86 World Cup victories of Swedish Alpine skier Ingemar Stenmark and won his sixth world cup overall. By his own colossal standards, the Turin Games of 2006 were somewhat frustrating. After suffering a bout of flu on the eve of the Games he took silvers in the pursuit, the 20km and bronze in the mass start. But having begun his Olympic adventures back at Lillehammer in 1994 he has nine medals to his name so far. The first of five golds came at Nagano 98 in the sprint after seeing the race abandoned while he was in the lead but keeping his cool to win the restaged event the day after. Out in Japan he also had the pleasure of racing with his brother Dag, the pair helping Norway to a relay silver. At Salt Lake's hilly Soldier Hollow Olympic course, his cross country strength paid massive dividends with a haul of four golds from the sprint, pursuit, 20km and relay. So began a period of dominance for Bjorndalen and few were his regular rivals. Frenchman Rafael Poiree, with a great career on the World Cup circuit, was the other ever present until his retirement in 2007 and Germany's Michael Greiss was the surprise star at Turin 2006, but the affable Norwegian is the undoubted star of the sport. He repeated the Salt Lake feat of four golds at the 2005 world championships, winning the same four in fact, and after 2009 where he again won four titles, he holds a record nine world championship gold medals. The secret of his success is a phenomenal work rate and he has been putting in around 1000 hours training a year since the age of 15. Since 1995, he has been honing his physical condition in a self designed structure with his own personal coaches. The Scandinavian also has a personal shooting coach to soothe his alleged fragile nerves while his wife is also a former biathlete, the Italian-Belgian Nathalie Santer. They call him the cannibal because of his terrifying appetite for victory. And if there were any doubts about his age playing a role his rivals may have been amused to hear Bjorndalen claim he'd race on until the 2014 Games in Russia.